Years ago when I found the living wreath, I was excited beyond belief. I quickly ordered one and set about to create my living wreath that would hang on the wall outside my kitchen window. 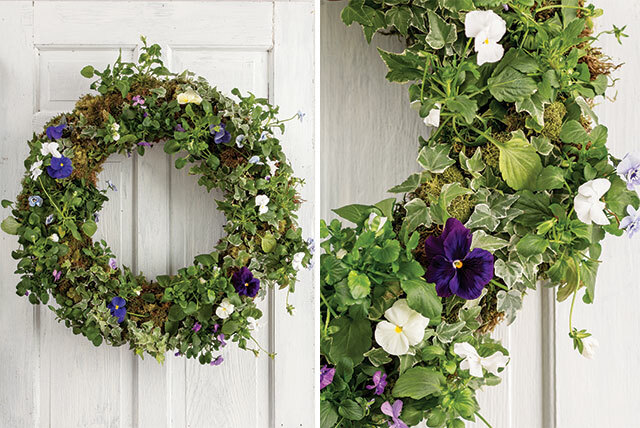 This winter my wreath has pansies as the main flower accompanied by ivy and vines. Elise at Collier’s Nursery here in Birmingham, Alabama, graciously agreed to show us how she puts together a living wreath. I hope you enjoy this video and will be inspired to enjoy flowers year-round. 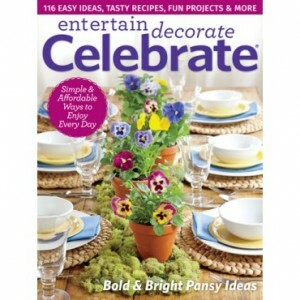 Purchase a live-wreath form from kinsmangarden.com (or enter to win one below! ), and then easily create your own wreath by following Entertain Decorate Celebrate‘s how-to video tutorial. For a limited time, get a subscription to Celebrate magazine for 25% off! Get 25% off with code CLSAVE25! Personally, I water mine often. Soak. Not all plants live. You will have to experiment. Don’t give up when one or two plants die. You just need to simply pull those out and replace. Spritz it on hot days once a day, but when it is cool outside you should have to only water it once a day. Put water in a water bottle. You don’t fully saturate the soil. Oh how I love this! I have never seen a wreath form or liner like this….Cant wait to visit Colliers and make one of these beautiful wreaths! Thanks Phyllis! Pansies are my favorite flowers. Thank you for this wreath tutorial. I can’t wait to make one for our patio door! So beautiful. I do love pansies. What a surprise when I went grocery shopping this week outside the door were racks of pansies in all different colors such a sign of spring even if it doesn’t feel like it. I live in Washington state. That was a wonderful video. I had never seen the wreath form before so it was very interesting. Thanks for posting that story. I am definitely going to try to do this when it warms up a bit! Love!! A hint of spring…on a really cold day up here in Toronto! Will keep this in mind for my front door. I have not made one of these but I would imagine you would take it off the wall and lie it flat to water. I live in Texas and fertilize my pansies every two weeks for great blooms. Pansies are my favorite flower. My grandmother always told me they were little smiling faces. A beautiful wreath. LOVE IT!!!!! how very gorgeous for the winter days. Love it. I can’t wait to make this wreath! It certainly reminds me of spring, and definitely makes me smile! Beautiful and fresh. A touch of spring and wonder for this time of year, Thank you. I imagine that this wreath must be watered very carefully . A beautiful gift for oneself and to someone special .